Click to view more about Valeria Fine Jewelry and our beaded engagement rings! At first glance, the beaded solitaire engagement ring at Valerie Fine Jewelry may look like an ordinary ring, but don’t let its simple design fool you. Beneath the polished center stone is a hidden trove of expertly executed beaded scrollwork surrounding a hidden gem. Lucas Horton, the owner and jeweler at Valeria, drew inspiration from the Baroque period when drafting this classic design. The intricate beadwork gives an antique feel to a contemporary ring, artfully combining old world craftsmanship with modern technology. In the ring’s early design stages, Lucas used comprehensive computer-aided design software to map out a 3D image of how he wanted the beaded solitaire engagement ring to look. Then he used lost wax casting to create a mold. 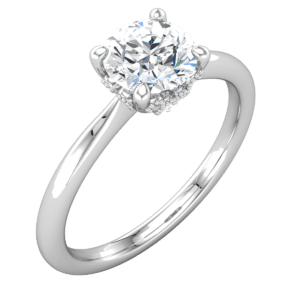 Even though each ring is formed using the same mold, the customization available at Valeria Fine Jewelry guarantees that no two rings will be exactly the same. Any 1/2- 1 karat round stone can be placed in the center setting, surrounded by diamond accents. The ring can be cast in sterling silver, rose gold, yellow gold, white gold, palladium or platinum. But no matter what material you choose, it will always come out smooth with a high shine polish. The beaded solitaire engagement ring is for the contemporary bride with a flair for vintage details. And with Lucas’ degree in gemology and personal connections with reputable diamond and gemstone dealers around the world, you can be certain that the materials used in each of his pieces are of the highest quality. Lucas wants to make sure that every client he works with comes away with a piece that far exceeds their expectations. He wants lifelong clients, not one-time customers. Don’t waste your time with big box jewelry stores; invest in a custom piece – like the beaded solitaire engagement ring – and know that Lucas is also invested in you. Be sure to visit our front page for more about Beaded Engagement Rings and also view our jewelry online.